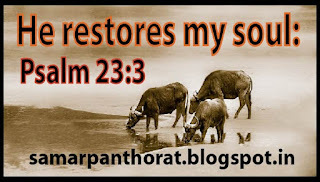 Psalm 23:3 He restores my soul. When we are thirsty our soul is in distress. Psalm 23:2 says He leads me beside the still waters. Whenever we are thirsty we feel low inside and outside. Means not only in body but in soul also we feel low. Our soul gets in trouble. But after drinking water we feel strength not only in our body but in soul and spirit man. This verse is saying about that same feeling what we go through. God wants to restore our soul with fresh water. Dear Lord thank you for leading me toward freshwater and restoring my soul. I Love you, Jesus.